Good morning lovelys and welcome to There's Nothing On My Worktop Wednesday. Well apart from two mats and the guillotine, because I have my sister and brother in law from Netherlands staying so card making is not on the menu at present. But to show I appreciate you dropping by I'll share a pic of the goodies I got at the show last Thursday. Margaret and I had a wonderful time, and we met up with Chris and also met Jo and her hubby and friends. Didn't I get a lot for my money, very hard to resist some things. I had a list and only managed to buy two of the five things on it, so to make up I had to buy other things! About 10 items for every list item I failed to get!! 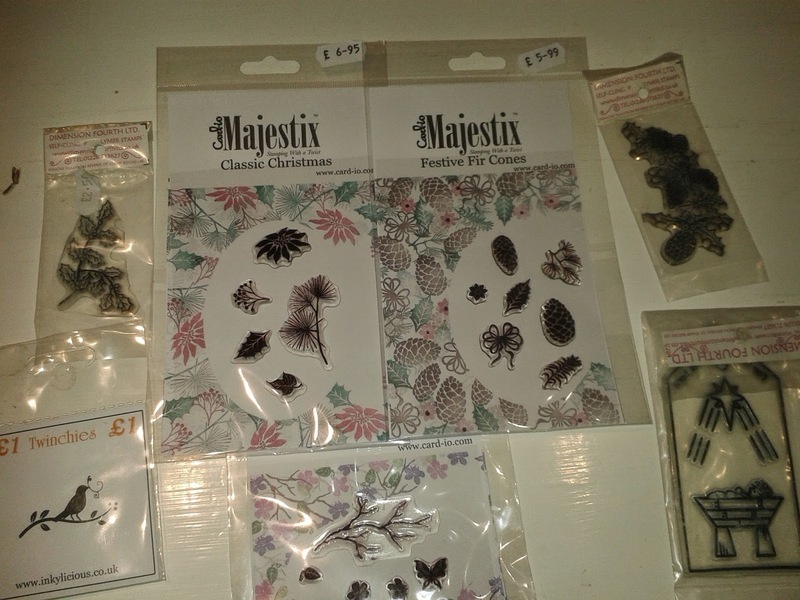 So you can see Inka Gold and ink dusters and stamps and dies, some lovely 12" Christmas papers, (16 designs, two of each in a pack, £3.99) so Margaret and I shared the pack, ink pads, butterflies to colour, a stencil and some card. Well these stamps were not on the list, but the Majestic stamps are so beautiful I could have bought dozens of them so three lots was very restrained and the other stamps were £1 each, I just couldn't leave them there, could I? The bird on the branch is very cute and has been used already. Actually on my list was the Christmas decoration die, in the centre. When I was visiting some WOYWWs last week, I followed some links on someone's page and saw it and thought it was such fun, I just had to have it. The other very naughty dies just hopped of the shelves and into my hands!!! Oh I could have spent so much more on dies, they were all so tempting. 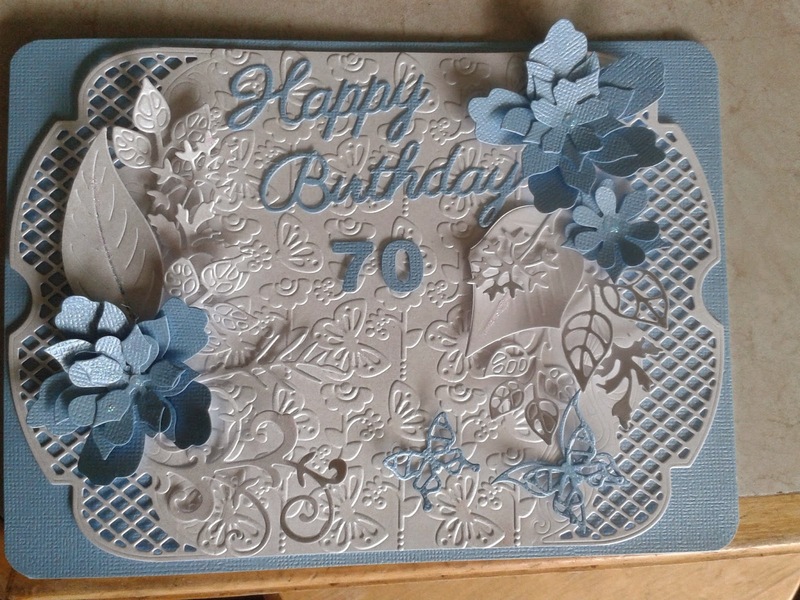 And finally, just to show that I do craft some time, and don't just buy stuff, this is a 70th Birthday card I was asked to make for some one and intended to use one of the new dies on it and it didn't look right. Now if you have landed on this page and wonder why I am baring all, so to speak, click on the link and visit Dame Julia who is hosting, as always on a Wednesday, a display of crafting desks from around the world. Bless you for coming in, and I will visit all those who make a comment and I hope many more, but we are out all day in Snowdonia enjoying the views and the sunshine. ah Chris thanks so very much for sharing your yummy goodies with us.. they do all look so delicious, I have often wondered what that Inca gold is like?? is is like a gold rub on? ah dies they are my weakness too love the card you made .. really great work! happy WOYWW Shaz in Oz.x # no number yet. Morning Chris. Glad to see your new stash is already being used - so's mine!! Have a great time with family. Oh wow what a great bunch of new toys!! Must be fun to try them all out! I love your birthday card, looks like chinaware! I just hate it when I come home from a day shopping and find all those things that followed me home without permission! LOL It seems to be a general problem with craft supplies, they have a mind of their own. Enjoy playing with all the new toys! When I retired I had to really slow down on buying things. Some days I feel like I just have to have something new. Enjoy your new supplies! Looks like you did very well on the stash front and even better on the meeting up with friends front. Thanks for stopping by today. Glad it's not just me who has to buy stuff that's not on my list to make up for not being able to get everything on my list lol!!! Lovely card. Love the card and so many interesting things waiting to be used. Beautiful birthday card! 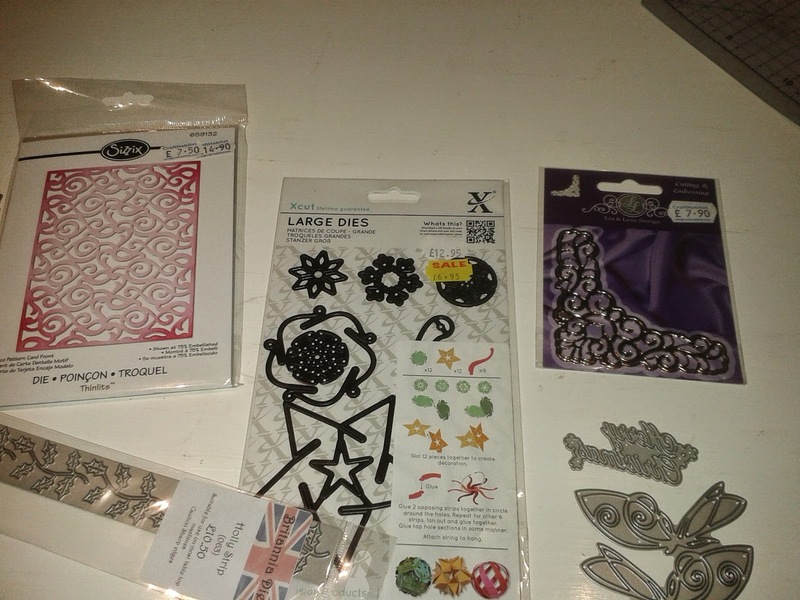 Loving the new crafty goodness you purchased! Geez...I would love to should with you! You find awesome items! Oh wow, you sure did get some fabulous goodies. Your card is stunning, so much work and yet so delicate. I love it. 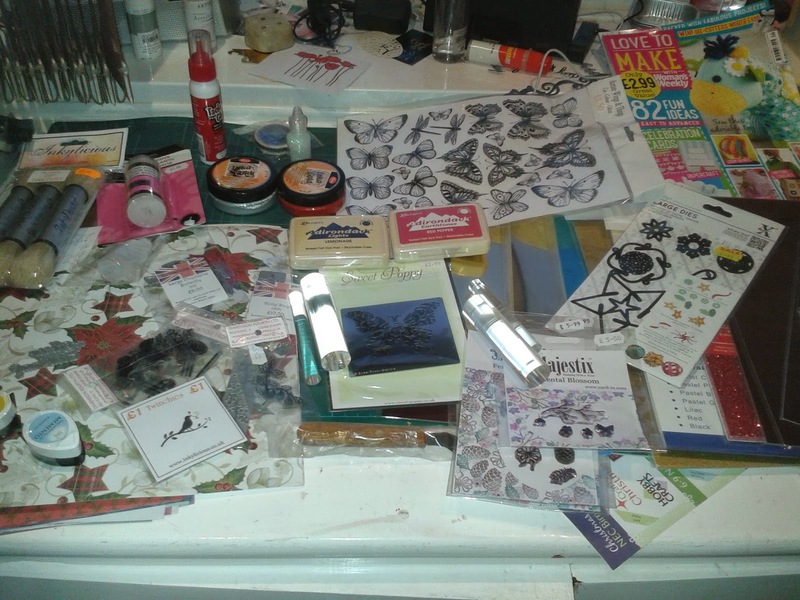 What a fab lot of new stash you managed to buy and how lovely to have met up with such special blogging friends too. Enjoy your Dutch visitors. Looks like you had some fun with the retail therapy and now you are twisting my arm to get some done too. Nah no time for that for me atm. later ok. now i am intrigued about the Christmas die and what you saw on that link. Hmmm have a great week crafting.